Instagram Lite, a much smaller version of the full Instagram app, has now landed in the Google Play Store. The app, which only 573K in size, was quietly released into the store late yesterday and appears to be limited to testing in Mexico at the moment. A broader roll out is expected, but it isn’t clear when that will happen. The introduction of a lite version of Instagram goes with a current trend that is happening within app development which is to bring lighter weight apps that require less resources to mass of Android devices out in the market, especially in developing markets. 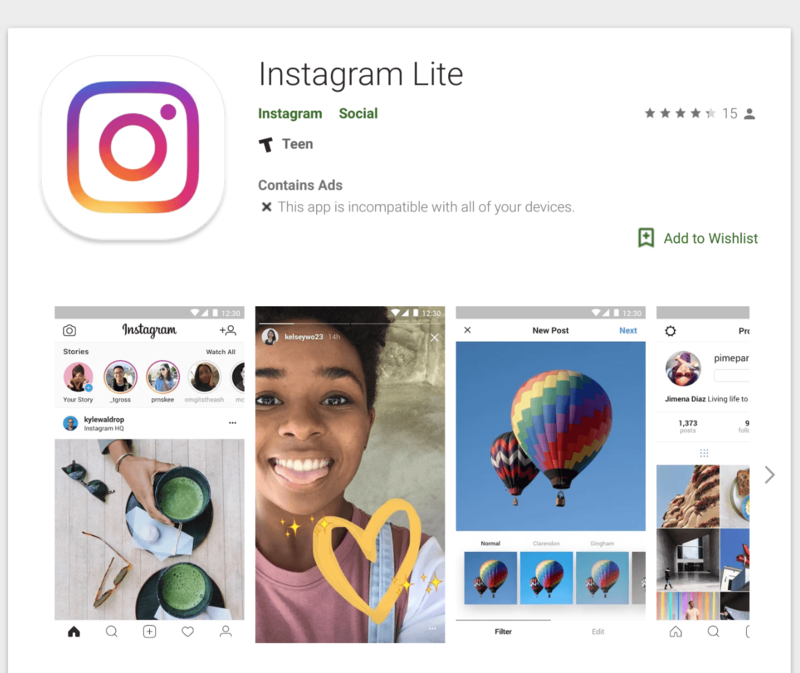 Instagram Lite, like other “lite” apps or the Google Go apps, are aimed at devices with a limited amount of storage, usually 8GB, and a low amount of RAM, usually 1GB. Running full fledged apps on these devices, in some cases, simply isn’t possible. With this new lite version of Instagram, there are some limitations as you would expect. First, you cannot share videos like you can in the regular app, and direct messaging is also not supported. As for which markets this new app ultimately lands in, that is still unclear. Instagram hasn’t officially even announced the app and all indications point to it still being tested. While you can find it in the Play Store here in the United States, it is listing as being incompatible for all devices for everyone. That doesn’t mean that it will be this way long term. Instagram could simply be phasing the roll out of the app.